Most people these days could consider themselves “amateur photographers.” You, your friends, and your family members probably have a Facebook account, Instagram, or other social media account (and most likely more than one) filled with photos. Instead of going to a professional photographer once or twice a year, parents can take photos of their children all year long and share them online so that grandparents, other family members, and friends can check in and see how everyone is doing. Photographs are everywhere and why shouldn’t they be? Documenting your child growing up, your adventures abroad, and even just some quiet time with friends is fun and a great way to keep the memories fresh years down the road. Photography can be a hobby or a career, but either way, it is an important art. If you are ever wanting to take your skills to the next level, why not try browsing through some of the top photography courses online? A growing trend at weddings is to leave disposable or Polaroid cameras around so that guests can take photos, alongside or in place of a wedding photographer. Schools may keep a tablet or camera so that they can take photos of children doing activities in their classes to share with families. You’re always sure to have a few photos of your birthday party, bachelor/bachelorette party, vacation, and any number of other events because chances are at least one person is taking photos, on their phone or another device. There are obviously many ways someone can get into photography as a career. Professional photographers are hired for weddings, school photos, senior photos, yearly family pictures, pregnancy, and newborn portraits, prom photos, etc. Many marketing and social media managers for companies big and small also need to be able to take professional level photographs, as their jobs often require them to post images of whatever product or service they are offering online on platforms such as Twitter, Facebook, and Instagram. There are certain skills needed to take quality photos that properly show off, for example, a dress that is being sold online. If you are a creative person, learning professional photography skills can add to your portfolio and even open some job opportunities. But what if you don’t want to go into a photography related career? What if you’re in a field where you rarely, if ever, need to be the one taking photos? There’s still reason for you to take a photography class or two. As mentioned, photography isn’t limited to professionals or artists. Are you a parent? If you don’t know how to properly take a photo, be it on your phone or with a camera, all those memories of your children that you’re trying to document may end up blurry, out of focus, or just generally not the kind of quality you’d want when trying to show off your kids or keep mementos of special occasions. By taking a photography class and sharpening your skills, you could start taking better, higher quality photos for photo albums or just for sharing online with friends and family. Are you a student? Chances are at some point you’ll need to do some sort of project beyond just a writing assignment. Maybe you’re doing a research project that you have to present. Adding visuals to presentations or even just write-ups of your research can add appeal and keep people engaged. Sometimes adding clipart or photos sourced online isn’t always the best idea, either. Maybe you’re studying to be a teacher and one of your projects is to shadow a class for a day and then present on the experience. Taking photographs of the classes and what activities you do adds a sense of “realness” when you share – people can see what you were doing instead of just listening to you describe what you did. Whatever your reason for wanting to study photography, studying online is a great option for almost anyone. There are university courses available if you’re serious about wanting to study photography and go into the field professionally, but taking in-person classes isn’t always right for everyone and may even be unnecessary, depending on the reason you’re wanting to take a photography class. Some people even “stumble upon” a career in photography– they start out taking photos at friends weddings and end up doing it as a way of making money for others, they go into marketing and start snapping shots for the company Instagram, they become the go-to person for documentation photos in a research lab. These types of professionals didn’t necessarily go to school for photography and may not want to go back to school to develop their skills, but having the extra help that taking a course can provide is still something they want. Another reason to study online is that the environment can help to prepare you for the life of a freelance photographer if that is the route you’re going down. Online courses tend to be of the “go at your own pace” variety. There are no class times to show up for, no real deadlines, and if you’ve chosen a free online class, no money lost if you never finish the class or complete the coursework. When you’re taking an online class, you have to carve out the time to spend on going through readings, videos, etc., completing any assignments, and studying. You have to be the one to set and complete your goals. You’ll have an online community of peers to bounce ideas off of and discuss anything you have questions about, but there’s nobody there in person to push you to do well. You have to do that yourself. This is how your working life may be as well! You’ll have to find your own clients, set your own schedule, handle your own billing, etc. Without a boss to answer to, you have to answer to yourself and taking courses where you have to be the one to push yourself can help you prepare for that kind of career. 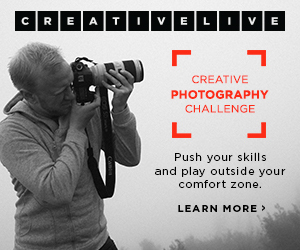 You can find all kinds of photography tutorials online, but if you want one place where you can find a course on pretty much anything you might want or need to know about photography, check out CreativeLive. The site was started by a community of artists and instructors whose goal is to provide accessible ways to learn different art forms and they are certainly doing a great job of providing as many courses as they can. There are over 900 courses just in the photo and video section alone, so you’re sure to find a course for you. You can go through the lessons in each course at your own pace, watching videos and taking quizzes on a schedule that suits your needs. Are you a complete beginner? Take Fundamentals of Photography. You’ll learn all about the different characteristics of photographs, different types of cameras, shutter speeds, types of lenses, exposure, focus, composition, types of lighting, editing, and much more. Most of all, you’ll be encouraged to use photography as a means of fulfilling your own personal creative visions. On the course description page, you’ll be able to see some examples of student work to give you an idea of what you might be able to achieve with a little extra help. There aren’t just courses for beginners, of course. Maybe you’ve already got the basics down but want to learn a specific style of photography. You can take a class like The Complete Wedding Photographer Experience, Fine Art Photography: The Complete Guide, or Get Started with Lifestyle Family Photography. These courses each focus on a different career field you could potentially go into with photography. They’ll go over the different techniques you’ll need to use in order to photograph a bride and groom, get the perfect shot of a large family, or create the kind of photographs you’d see in a museum. In order to take specific styles of photographs, you’ll need more skills beyond the fundamentals, so choosing a course like these could be a great choice for you. Whatever the reason for choosing to take one of the many top photography courses online, at the end of the day becoming a photographer is all about developing your creative side. Even if photography is your career and you’re doing it for business reasons, creativity and artistic skill is needed to take a great photo. Photos aren’t just snapshots of a given moment, they are art, a way of expressing ideas and emotions the same as any painting. If you’ve been considering taking a photography course, whether you’re wanting to add to your professional portfolio or just up your Instagram skills, check out CreativeLive or any of the other online photography courses out there. You may be surprised by how much creativity these courses can awaken within you.